The cast of Lyric Theatre’s Curious George: The Golden Meatball. Photo by KO Rinearson. The Lyric Theatre has done it again with their newest Theatre for Young Audiences show. 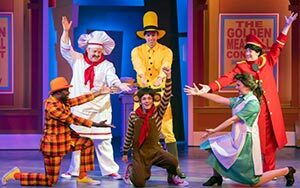 Curious George: The Golden Meatball is a delightful musical that’s suited for the youngest patrons in the family. Geared toward kids in the pre-k through third grade age ranges, the show features the sweet little monkey on his quest to help his friend enter the Golden Meatball contest in Rome. 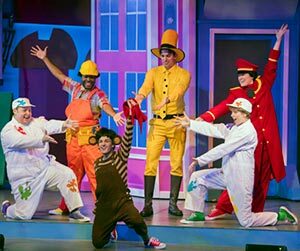 Gavin Guthrie is little George and he’s joined by his good friends, The Man in the Yellow Hat, Chef Pisghetti, Phinneas, The Doorman, and Netti. The classic characters that are known and loved by generations of children are joined by new friends and a brand new story for the stage. Guthrie is adorable and cute as the loveable monkey George. Guthrie’s mannerisms, facial expressions and sweet voice are reminiscent of a monkey but also childlike. He’s got the innocence and demeanor of a younger character, which is appealing to the children in the audience. Gore is George’s best buddy, The Man in the Yellow Hat, and together the two get up to fun antics and adventures. Larman’s take on Chef Pisghetti is jovial and happy. When things don’t go well for Chef Pisghetti, George sets off to help his friend win the cooking contest, an idea that takes him all the way to Rome. Of course, his group of loyal friends must follow. Bailey Maxwell as the Doorman and Jenna Mazzoccoli as Netti come along as well, and everyone is delighted to see the beautiful city and find George on his latest escapade. Elvie Ellis as Phinneas enters the contest as well, and his automatic meatball maker is the one to beat. If George can recreate the perfect recipe, and not forget the secret ingredient, he’s got a chance of winning The Golden Meatball. 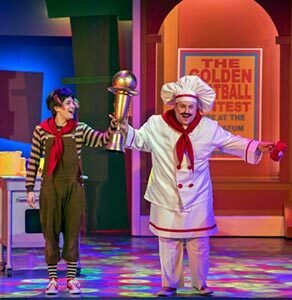 Gavin Guthrie as Curious George and Justin Larman as Chef Pisghetti. Photo by KO Rinearson. The musical numbers are lovely and quite sophisticated for a TYA production. Children’s theatre is not always as enjoyable for the parents, but the Lyric has thought of everyone. Matthew Sipress directs and choreographs an energetic and special show that is great entertainment for theatregoers of all ages. Costumes by Jeffrey Meek are pleasantly bright and colorful, fully detailed and recognizable to fans of the books. The Q & A session after the show gives the kids a chance to ask questions and talk to the actors, learning more about the process and production of musical theatre. No critic is tougher than an audience of kids. This production, while keeping the children in mind, is by no means dumbed down or simplified. That’s the great thing about this series at The Lyric. They don’t skimp on quality, and they provide their audience with age appropriate entertainment that shows them the magic of the theatre. One of the most important things we can do as parents is to introduce our kids to the arts. Shows where they can relate to the characters and feel welcome provide a fun and magical experience for the young ones. It’s equally fulfilling for the parents and grandparents to watch and enjoy with their kids. Kids deserve good theatre as much as adults, possibly even more. The dedication of the entire cast and crew has created a charming show that serves as an introduction to what is sure to become a lifelong love of live theatre. A few quotable preschoolers went on record when asked about the show. Three year old Harrison says “I liked the singing parts” while his five year old brother Asher replied “The part where George was doing flips was my favorite!” Liam also says “I loved when they painted George in the park. And I like the way the Man in the Yellow Hat danced!” Their moms had so much fun it was bananas. There may be a future reviewer in the ranks!